For many Americans, the word Thanksgiving conjures up images of family, a bountiful feast, and spending the day eating. However, Americans weren’t always encouraged to eat everything and anything on Thanksgiving Day. During both World Wars, food was rationed and families on the home front were encouraged to make do with less. So what did that mean for the traditional Thanksgiving dinner during World War I? 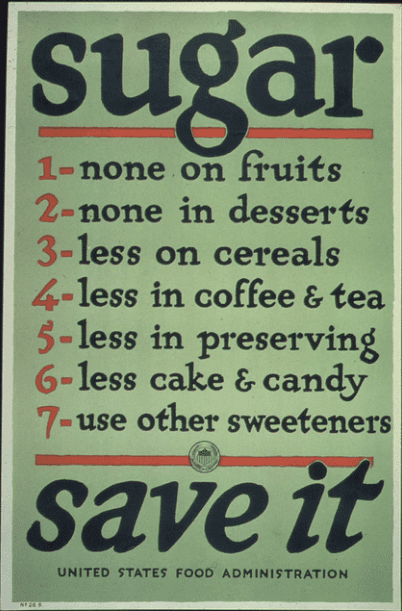 Poster: sugar conservation, from the U.S. Food Administration, 1917-1919. Credit: U.S. National Archives. Food rationing is typically associated with World War II, when ration stamps were used—but World War I had its own version of rationing—and this was especially true at Thanksgiving time. In the First World War, families were encouraged to limit some foods so that the United States could feed its soldiers and allies. Overseas, our allies’ lands were devastated by the extensive fighting, and their ability to maintain crop production was limited. Using propaganda posters, recipe booklets, and informational articles, American women were encouraged to alter the family’s diets by participating in such endeavors as “Meatless Monday,” growing a garden, and limiting the use of sugar. The government led the way in urging Americans to think about what they ate. Herbert Hoover and his U.S. Food Administration, established in August 1917, encouraged food conservation and helped to stabilize the price of wheat. Newspapers provided families with recipe ideas to help them compile their holiday menus. Women turned to newspapers for recipes and ideas about the type of Thanksgiving they should serve, and newspapers helped women implement these new policies to conserve food. No Oysters or Turkey for the Thanksgiving Dinner? What do you typically serve for the Thanksgiving dinner? While portions of the Thanksgiving dinner menu have changed over time, some of the key dishes have always been served. 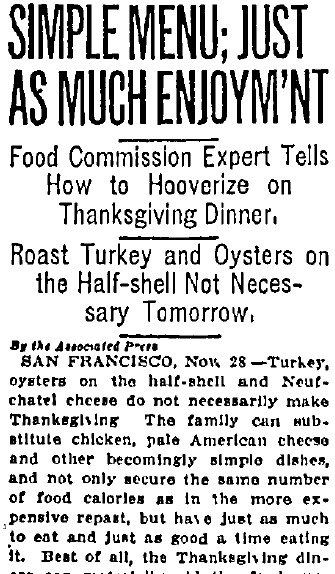 In this 1917 California newspaper article, readers are cautioned that they should refrain from serving oysters on the half shell, Neufchatel cheese, and turkey for Thanksgiving. Sugar was one of the food items that Americans were encouraged to limit. Today, in a world where much of the food we eat is prepared or pre-packaged, we don’t realize how much sugar is in a Thanksgiving meal. Cranberry sauce, gelatin salads, desserts and even sugar for coffee and tea were foodstuffs that families had to reconsider during wartime. It’s no wonder that newspaper articles like this one discouraged that old standby, cranberry sauce. 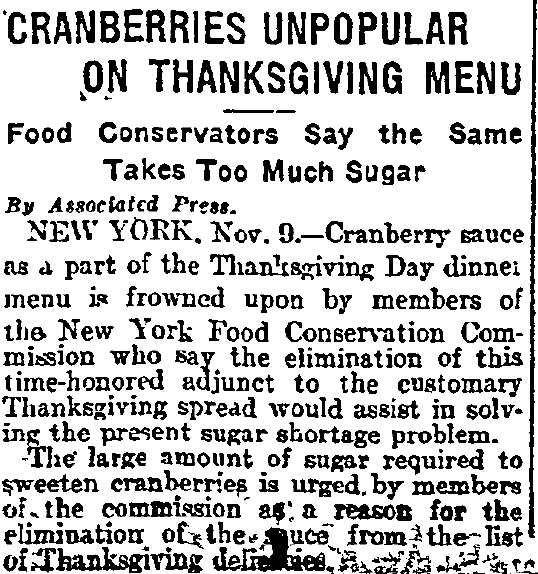 As pointed out in this old news article, cranberry sauce required large amounts of sugar that seemed, during this precarious time, to be wasteful. American citizens were encouraged to plant gardens to supply produce for their meals. For those unable to plant gardens, patronizing local merchants who produced and sold food was encouraged. This was a predecessor of today’s popular “Buy Local, Eat Local” trend. What did Thanksgiving dinner look like for your family during World War I? Do you have any stories about your grandparents’ Thanksgiving menu? Please share them in the comments below. I’m researching a new book, and this blog post was really useful! Great research–thank you! Thank you for your kind comments. Good luck with your book! I would like to invite you to read my blog about my family history, the story of a family that settled in Alabama before it became a state. I enjoy reading your blog also.